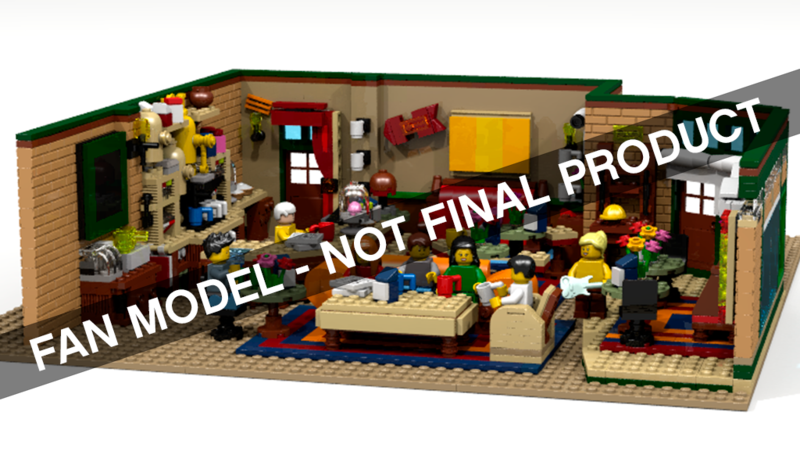 New LEGO Education sets are coming soon for the 2019-2020 First LEGO League Season. See below for the press release. New LEGO® Education SPIKE™ Prime and new SPIKE™ Prime Expansion Set can now be used in FIRST LEGO League along with LEGO® MINDSTORMS® Education EV3. HOUSTON, TEXAS (April 17, 2019) – Today at the FIRST® Championship, LEGO® Education and FIRST unveiled two new, exclusive LEGO sets created specifically for the 2019-2020 FIRST® LEGO® League Jr. and FIRST® LEGO® League season. 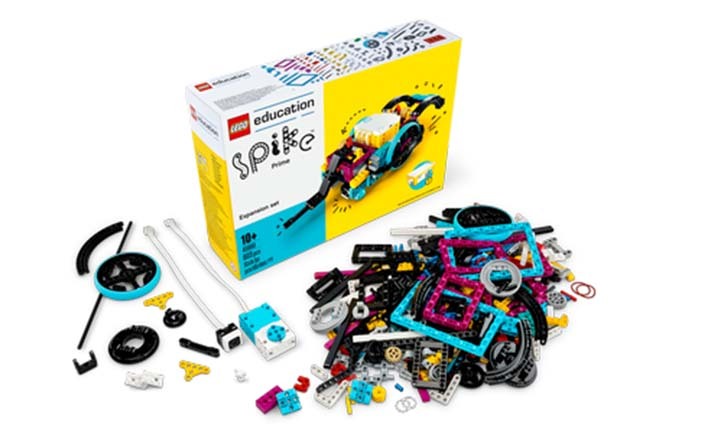 LEGO Education also announced today that its newly released LEGO Education SPIKE™ Prime with the new SPIKE™ Prime Competition Expansion Set can be used along with LEGO® MINDSTORMS® Education EV3 in FIRST LEGO League. LEGO Education SPIKE Prime and the SPIKE Prime Expansion Set can be pre-ordered today in the U.S. and will be available around the world in August 2019. FIRST, an international youth not-for-profit, and LEGO teamed up in 1998 to create FIRST LEGO League and FIRST LEGO League Jr. with the goal to give students around the world from 6 to 16 years old* a team-oriented in-school and afterschool activity to build confidence and friendly-competition spirit while also learning STEAM skills. Through its partnership with FIRST, LEGO Education is not only committed to helping every student build STEAM skills but also to build confidence through hands-on learning and team collaboration. The new sets and programs for the 2019-2020 FIRST LEGO League season are based on the theme of architecture and are titled BOOMTOWN BUILD℠” and CITY SHAPER℠. The 2019-2020 FIRST LEGO League Jr. BOOMTOWN BUILD Inspire set will reach more than 130,000 children, ages 6 to 10* from 41 countries and the 2019-2020 FIRST LEGO League CITY SHAPER Challenge set, which includes a new competition mat, will reach more than 320,000 children, ages 9 to 16*, from nearly 90 countries. Students are tasked with completing a challenge designed in partnership with architects and engineers and use a variety of LEGO Education products, including LEGO Education WeDo 2.0, LEGO MINDSTORMS Education EV3 and the newly announced LEGO Education SPIKE Prime and SPIKE Prime Expansion set. To learn more about FIRST LEGO League Jr. and FIRST LEGO League, visit www.firstinspires.org. 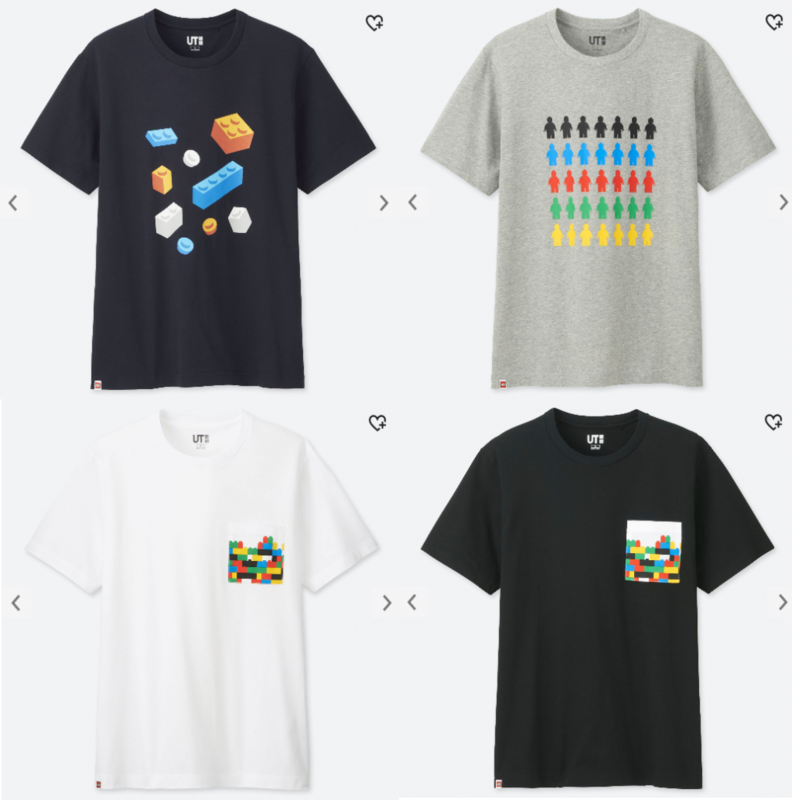 Uniqlo Canada clothing store is now carrying four new LEGO T-Shirts. They are priced at $14.90 CAD each and comes in sizes of extra small to extra large. Thanks to Jeff for writing in with the news. 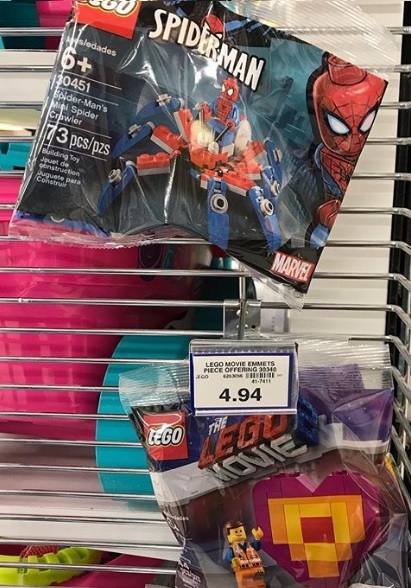 New LEGO polybags have been spotted at Toys R Us Canada stores. Price is $4.99 each. Some of the polybag sets are also available for purchase online. The Sky Police Jetpack is a bit small, but it does feature 2 minifigures while the other polybag sets features only 1 minifigure. 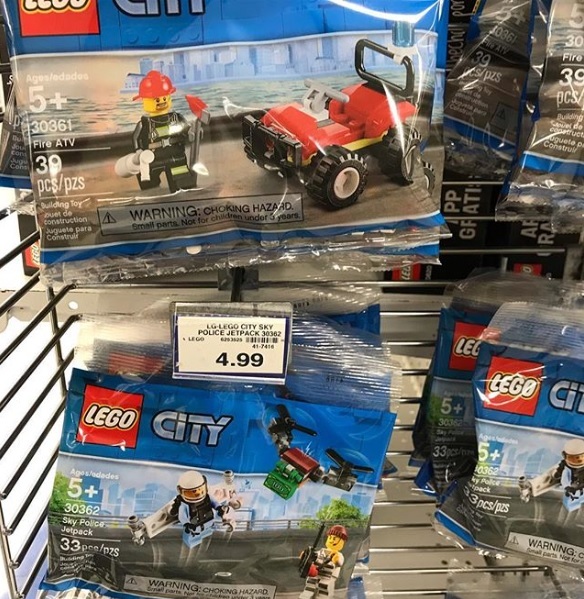 For those living in the United States, check your local Target store for these polybag sets as they may appear there. A brand-new set is coming March 1st, 2019! 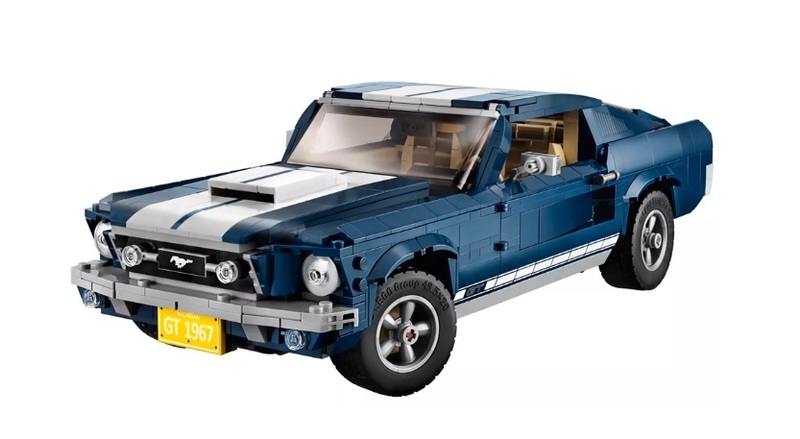 Known as LEGO 10265 Creator Expert Ford Mustang, the set will feature 1471 pieces and will be recommended for those aged 16+. Price will be $149.99 USD / $199.99 CAD / £119.99 GBP. Additional pictures can be found at LEGO Shop at Home (US | Canada | UK). 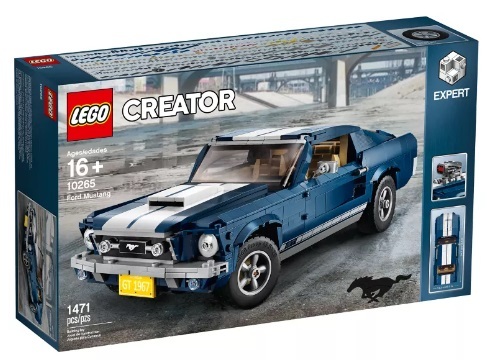 Authentic replica of a 1960s Ford Mustang featuring dark-blue bodywork with white racing stripes, air scoop, 5-spoke rims with road-gripping tires, and a selection customization add-ons. Open the doors or remove the roof panel to access the detailed interior with handsome seats, radio, mid-console gearshift and working steering. Open the trunk to store items and lift the hood to reveal a detailed Ford Mustang V8 engine with battery, hoses and air filter. Also includes a printed mustang grille badge and 2 GT emblems. Customize the Ford Mustang with the included supercharger, rear ducktail spoiler, beefy exhaust pipes, front chin spoiler and a nitrous oxide tank. Choose from a selection of license plates. Lift the hood to check out the realistic engine detailing. Adjust the lift of the rear axle for a real mean look! This Mustang toy car model includes 1,470 pieces and is suitable for ages 16+. 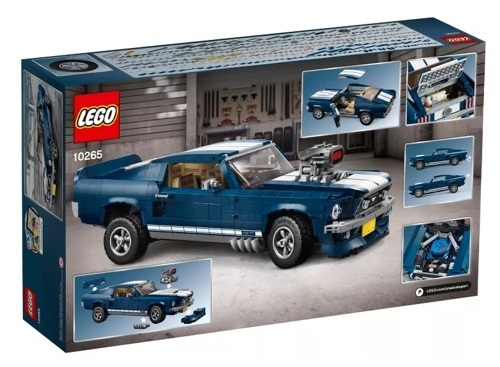 New-for-March-2019 special elements include 5-spoke rims, 2×8 brick with bow, 1×3 mustang logo tile, 2×4 bow with ‘GT’ Emblem. Measures over 3” (10cm) high, 13” (34cm) long and 5” (14cm) wide. The Second 2018 Review LEGO Ideas Results are now here! There are two winners out of ten possible entries that contains 10 000 supporters. These include Steamboat Willie and The Central Perk Coffee of Friends. Congrats to Máté Szabó and Aymeric Fievet! 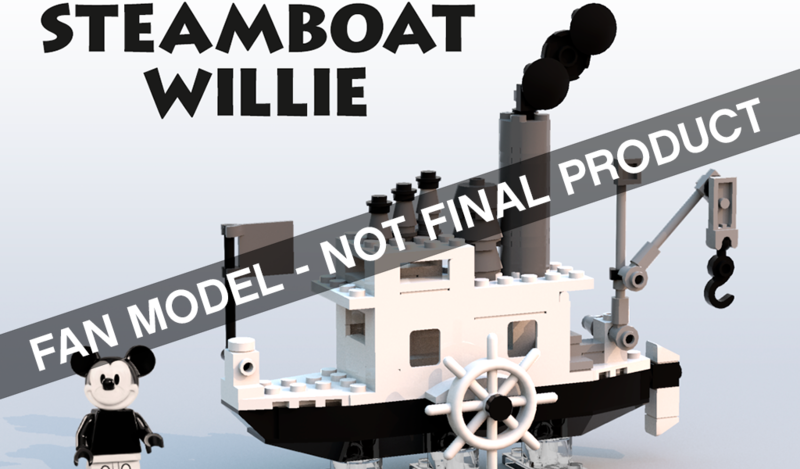 Both sets are expected to be released sometime in 2019. 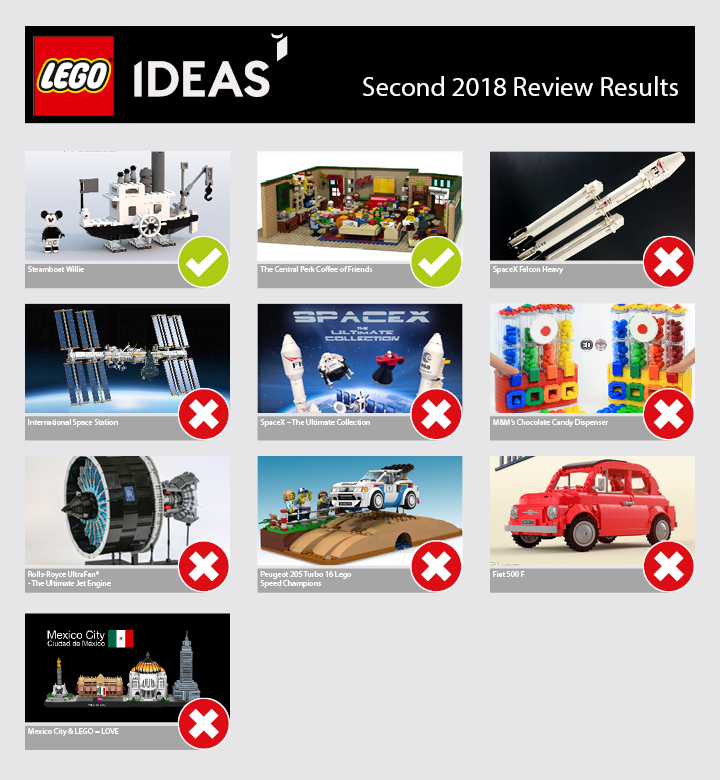 The Third 2018 Review LEGO Ideas Results would be coming Summer 2019.